Wisconsin's park systemis accessible to all people. Barrier free campsitesand picnic areas have been installed at nearly every state park. Many parks also feature trails, overlooks, beaches and piers that are fully accessible. The park system contains a number of parks that are less crowded because they are off the beaten path. Each of these less visited parks has unique attractions, and they all offer camping, nature trails and fishing. Perhaps less well known than the state park system are Wisconsin's national recreation lands. This 825-acre park south of Superior on Hwy. 2 features waterfalls and rapids along the Amnicon River, viewed from a covered foot bridge. Camping, picnicking, and interesting geology. C/o 6294 S. State Rd. 35, Superior 54880-8326. Winter: (715)399-3111; Summer: (715) 398-3000. Current conditions. Park map. Reserve a campsite. The Belmont Lions Club operates and maintains this park. Belmont Mound, an outlier of the famed Niagara dolomite escarpment, reaches nearly 400 feet above the Village of Belmont. From the 64-foot observation tower on top, you can see for many miles in all directions. The wooded mound abounds in berries and wildlife. It has picnic and playground facilities but no camping. Wisconsin's First Capitol historic site is less than a mile to the west. c/o 7896 Lake Rd., Blanchardville 53516. (608) 523-4427. Located on Madeline Island, the park features picturesque sandstone bluffs with caves where Lake Superior laps at the shoreline. A family campground, including walk-in campsites; outdoor and indoor group camps; hiking and nature trails; and 1.5 miles of sand beach await visitors. Box 589, Bayfield 54814-0589. (715) 747-6425. Park map. This 272-acre park on the shores of Lake Geneva offers wooded campsites, 2,200 feet of sand beach and picnic areas. Located in resort and recreation area. Year-round alcohol ban. Open mid-May through October. 1452 Hwy. H, Lake Geneva 53147. (262) 248-2528. Spectacular view of the countryside from the highest point in southern Wisconsin. Observation towers, wooded campsites, swimming pool with a lift for people with disabilities, picnic areas and hiking, and nature and cross-country ski trails offer year-round recreation. Rustic cabin for people with disabilities. 4350 Mounds Park Rd., Box 98, Blue Mounds 53517-0098. (608) 437-5711. Current conditions. Park map. Swim, fish, boat on two spring-fed lakes in this day-use recreation area in Green County. Enjoy nature trails and explore a 600-acre wildlife area. Tables, grills and shelters provided. C/o P.O. Box 805, New Glarus 53574. Summer (608) 966-3777. Park map. A 2,500-acre peninsula in the Castle Rock Flowage of the Wisconsin River offers a full range of water-related activities. A paradise for hunters, hikers and nature lovers. Outdoor group camp, 24 cart-in campsites, two-level accessible wildlife blind. W8450 Buckhorn Park Ave., Necedah 54646-2789. (608) 565-2789). Current conditions. Park map. This new state park in Dane County was established during Wisconsin State Parks' 2000 centennial year. Capital Springs is a partnership project between Dane County Parks and Wisconsin State Parks. Although still in the planning process, Capital Springs offers many recreational opportunities including hiking, biking, fishing, wildlife watching, picnicking and camping. 3101 Lake Farm Road, Madison, 53711. (608) 224-3606. The 15,300-acre Chippewa Flowage is in Sawyer County east of Hayward. First filled in 1924, it is now Wisconsin's third-largest lake, with an irregular, wooded, and generally undeveloped 233-mile shoreline and about 200 undeveloped islands. It is known for its spectacular natural scenery and fishing. Public access points on the flowage are a starting point for a wilderness experience. Camp at one of the primitive island sites. 10220 State Hwy 27, Hayward, WI 54843 (715) 634-2688. Situated in an area of unspoiled beauty with kettle lakes and glacial features. The interpretive center sits atop a hill that was once a glacial lake bottom. The tranquil Ice Age Trail traverses through hilly, heavily forested terrain where a multitude of bird life abound. A visitor center generally is open from 8:30 to 4:30 daily; call ahead to verify. Box 13394, County Hwy. M, New Auburn 54757. (715) 967-2800. Park map. This 48-acre park features an Indian burial ground from the Copper Culture about 6,000 years ago, the oldest cemetery site in Wisconsin. Locally owned park museum offers a detailed look at Copper Culture life and times. (Admission charged. Call for hours.) Also enjoy the 15-acre short-grass prairie or fish the Oconto River. Vehicle admission sticker not required. C/o N10008 Paust Lane, Crivitz 54114. (715) 757-3979. Canyons, streams and waterfalls to delight photographers, hikers and cross-country skiers; just north of Mellen in Ashland County. Swimming beach, miles of trails. Family campgrounds, plus walk-in and backpack campsites available. Route 1, Box 17AA, Mellen 54546. (715) 274-5123. Park map. Located along the beautiful Wisconsin River a short distance northwest of Merrill. A campground with modern rest rooms, swimming beach, picnic areas, shelter house and a physical fitness trail await visitors. N1895 Council Grounds Dr., Merrill 54452. (715) 536-8773. Current conditions. An Ice Age unit where 500-foot bluffs flank a 360-acre lake. Swimming, fishing, boating (electric motor only), canoeing, scuba diving, hiking, nature center (by appointment during off-season), year-round naturalist and cross-country skiing. S5975 Park Rd, Baraboo 53913-9299. (608) 356-8301; TDD (608) 356-4274). Current conditions. Park map. This 123-acre area has nearly a mile of Lake Michigan shoreline, scenic wooded bluffs, grasslands and wetlands. It is managed by Manitowoc County. No camping. C/o 4319 Expo Dr., Manitowoc 54220. (920) 683-4185. 5,000 scenic acres of steep hills, bluffs and deep valleys, plus two lakes offering swimming, fishing and boating (electric motors only). Hike through oak-hickory woods, ride horses over rolling hills, picnic near sandstone bluffs. 4175 Hwy. 23, Dodgeville 53533. (608) 935-2315. Current conditions. Park map. This new park in Marinette County, established during Wisconsin State Parks' 2000 centennial year, is not yet fully developed. Master planning for it is underway. N10008 Paust Lane, Crivitz, WI 54114. (715)757-3979, fax (715)-757-3779. Park map. This 1,417-acre quiet and friendly natural gem is near the beautiful spring-fed Chain O' Lakes. Year-round camping, Hellestad House log cabin, Whispering Pines day use area on crystal-clear Marl Lake on the upper "chain." N2480 Hartman Creek Road, Waupaca 54981-9727. (715) 258-2372. Current conditions. Park map. Havenwoods is an island of nature within an urban Milwaukee environment. Environmental education programs and walking trails are available for educators, youth groups, families and adults. Environmental Awareness Center. 6141 N. Hopkins, Milwaukee 53209. (414) 527-0232; TDD 414-527-0761. Current conditions. Forest map. Experience "living history" at this 40-acre outdoor museum in Green Bay. The park features 25 structures from Wisconsin's past. Per person admission charged. 2640 S. Webster Avenue, Green Bay 54301. (920) 448-5150. This park of 1,145 acres rests on limestone cliffs overlooking Lake Winnebago. History and geology buffs will want to visit the park to learn about effigy mound builders, lime kiln, quarry operations, camping and the scenic overlook. N7630 State Park Road, Sherwood 54169. (920) 989-1106. Current conditions. Park map. Hilly, wooded recreation area in northeastern Dunn County near Menomonie. An outdoor group camp for youth groups, an observation tower, a self-guiding nature trail and hiking/skiing trails are available. 921 Brickyard Road, Menomonie 54751. (715) 232-1242. Park map. This marked 115-mile road route is the scenic connection between the Kettle Moraine State Forest Northern, Pike Lake, Lapham Peak, and Southern Units as well as numerous natural and scenic landmarks, local parks, and historic sites. A 29,268-acre gift of the glacier--the rolling, wooded landscape is dotted with serene lakes and offers a unique outdoor recreational experience of endless variety. Henry S. Reuss Ice Age Visitor Center, on State Highway 67, 1/8 mile south of County Highway G, is open seven days a week, (920) 533-8322. Forest Headquarters, N1765 Hwy. G, Campbellsport, WI 53010, is open Monday through Friday, 8 a.m. to 4:30 p.m., (262) 626-2116. Current conditions. The glacier left 21,000 acres of rolling hills and numerous lakes. Humans contributed beaches and boat launches, trails for horses, off-road (mountain) bikes, snowmobiles, cross-country skiing and hiking, picnic areas and four campgrounds. Cabin for people with disabilities. S91 W39091 Hwy. 59, Eagle 53119. (262) 594-6200. Current conditions. Forest map. Year-round, this 1,000-acre scenic gem on the shore of Lake Michigan offers a peaceful feeling. Relax in a shady campsite, walk barefoot on two miles of beach, tour the nature center, or stroll along two nature trails. 1020 Beach Park Lane, Sheboygan 53081. (920) 451-4080. Current conditions. Park map. Kegonsa means "lake of many fishes" and it is one of southern Wisconsin's most productive fishing holes. The White Oak Nature Trail's effigy mounds are of great interest to many visitors. The woodlands, prairies and wetlands attract campers, hikers and skiers. 2405 Door Creek Road, Stoughton 53589. (608) 873-9695. Current conditions. Park map. Created by Wisconsin-Minnesota Light and Power Company in 1918, the 6,300-acre lake attracts anglers after walleyes, muskies and bass. Scenic trails edge the shoreline and wind through woodland, prairie and marsh. 18127 CTH O, Chippewa Falls 54729. (715) 382-4574. Park map. This new 22-acre park in Milwaukee is not yet open to the public. It is on the shore of Lake Michigan adjacent to the Henry Maier Festival Grounds. C/o P.O. Box 12436, Milwaukee 53212. (414) 263-8570. Park map. Located near Delafield, 1 mile south of I-94, Lapham Peak features a 45-foot observation tower on the highest point in Waukesha County. The glaciated topography also provides excellent hiking and cross-county skiing. Enclosed shelters for all seasons. W329 N846 Cty. C, Delafield 53018. (262) 646-3025. Forest map. The Loew Lake Unit is a picturesque valley including the winding east branch of the Oconomowoc River and the 23-acre Loew Lake. It is open to low-impact recreation, including hiking, hunting, and horseback riding (no camping). The Ice Age National Scenic Trail goes through the property on the west side of the Oconomowoc River. C/o 3544 Kettle Moraine Rd., Hartford 53027. (262) 670-3400. Some 1,922 acres of this 4,450-acre property are located on the Wisconsin side of the Menominee River, east of Pembine. Primarily limited to foot travel only, the area provides opportunities to view waterfalls and birds, canoe, hunt, fish, and hike. Several one-night undeveloped camping sites are available along the river. P.O. Box 199, Wausaukee, WI 54177. (715) 856-9160. Picturesque rock formations dominate the land. Part of the Ice Age National Scientific Reserve, an ideal place for picnicking, swimming, camping and hiking. Scenic views from the top of Mill Bluff. C/o Box 99, Ontario 54651. (608) 337-4775, Memorial Day - Labor Day (608) 427-6692. Park map. Inspect a natural arch of sandstone with a rock shelter used by people when the glacier was melting, 11,000 years ago. On County Highway C, 12 miles west of Devil's Lake in Sauk County. No camping. C/o S5975 Park Road, Baraboo 53913-9299. (608) 356-8301; TDD (608) 356-4281. Take in a panoramic view of the Mississippi River or relax in wooded campsites atop the bluffs overlooking the Mississippi. Visit Stonefield, home of Wisconsin's first governor, Nelson Dewey, and Stonefield Village, a reconstructed 1890 village. Open year round. Box 658, Cassville 53806. (608) 725-5374. Located near the Sugar River Trail, you'll find camping as it was intended, with drive-in or hike-in campsites of quiet solitude. A picnic area and playground. Nature trails lead to wildlife and the beauty of undisturbed woodland. Box 805, W5446 County Trunk Highway NN, New Glarus 53574. (608) 527-2335. Park map. One of the state's outstanding scenic features is 165-foot-high Big Manitou Falls, highest in Wisconsin. Hiking trails, nature center, sand beach and interpretive programs entertain and educate visitors 6294 S. State Rd. 35, Superior 54880-8326. (715) 399-3111. Park map. On a peninsula jutting into Green Bay waters, the 3,776 acres of forest include four campgrounds, bike trails, an observation tower, summer theater, a 125-year-old lighthouse and an 18-hole golf course. Visitors explore bays fringed by sand and cobblestone. Islands and ships can be viewed from the bluffs. Box 218, Fish Creek 54212-0218. (920) 868-3258, golf course (920) 854-5791 May-Oct. Current conditions. Park map. This forest comprises about 9,200 acres of undeveloped forest along 70 miles of the Peshtigo River in Marinette County. The forest is in the master planning process. A section of the forest is adjacent to the new Governor Thompson State Park. The forest is open to the public with opportunities for canoeing, fishing, boating, hunting, snowmobiling, cross-country skiing, and hiking. c/o N10008 Paust Lane, Crivitz 54114. (715) 757-3965. The point juts seven miles into Lake Michigan, and the six-mile beach occasionally yields pieces of 19th century ships that sank here. The sandy shore of Lake Michigan is a fascinating place just to walk, look and indulge in some aimless beachcombing. Interpretive center and indoor group camps. 9400 County Hwy. O, Two Rivers 54241. (920) 794-7480. Current conditions. Forest map. This billion-year-old hill is one of the oldest geologic formations on earth. The top of the 60-foot observation tower is 700 feet above the surrounding plain and offers spectacular views.Camping May through October; snowshoeing and downhill skiing [exit DNR] in winter. 4200 Park Rd., Wausau 54401. (715) 842-2522. Current conditions. Park map. The French name refers to the 300-foot high rock outcropping that is the central feature of this quiet park. Climb the stairway to the top for a panoramic view; picnic areas, hiking trails and 41 wooded campsites, also featured. 1767 Hwy. 13, Friendship 53934-0100. Summer (608) 339-6881, off-season (608) 565-2789. Current conditions. Park map. A 225-acre park located within 1-1/2 miles of Wisconsin Dells. Eighty-nine wooded campsites offer seclusion, while pine trees and sandstone bluffs offer a cool escape to the picnicker or hiker in this summer park. C/o E10320 Fern Dell Road, Baraboo 53913. Summer (608) 254-8001, fall, winter, spring (608) 254-2333. This new 2,780-acre park in northwestern Wisconsin has a lake, river, woods, wetlands, and prairie. For now, it's open only to foot traffic. C/o Box 703, St. Croix Falls 54024. (715) 483-3747. Park map. This area, southwest of Mercer in Iron county, has 60 campsites, accessible by water only, and six public boat landings. The flowage is known for its walleye fishery and also has muskellunge, northern pike, bass, sturgeon, and panfish. It has the highest density of bald eagle, osprey, and loon breeding pairs in Wisconsin. C/o DNR Ranger Station, 3291 State House Circle, Mercer 54547. (715) 476-2240. 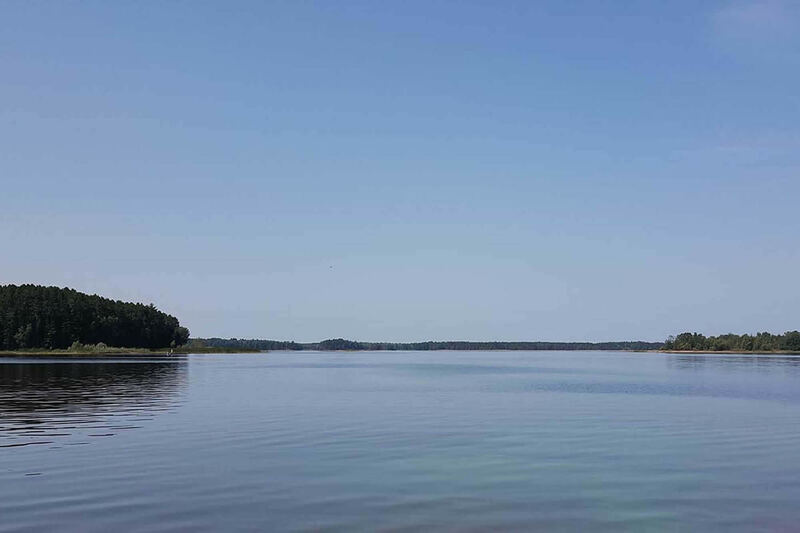 This Door County park offers rugged Lake Michigan shoreline, dense upland forest, shoreline on an interior lake, a winding creek with wetlands, and the highest sand dunes in Wisconsin. Many features for people with disabilities. No camping. 3275 County Highway WD (Clark Lake Road), Sturgeon Bay 54235. (920) 823-2400. Park map. Canoeing on the winding Kickapoo River and horseback riding for those who bring their own horses are the highlights. An observation point overlooks the Kickapoo Valley and the Village of Ontario. Camping, hiking, fishing, cross-country skiing. Box 99, Ontario 54651. (608) 337-4775. Current conditions. Park map. Described as "almost Canada," this flowage in Oneida County has a wild flavor. The area has more than 17,000 acres, 73 miles of shoreline, 106 islands, and seven boat landings. Rustic campsites around the shoreline and on the islands offer scenery and solitude. There are abundant walleye and panfish; northern pike, muskellunge, and bass; hunting and hiking opportunities; deer, bear, ruffed grouse, ducks, loons, and wolves. C/o 8770 Hwy J, Woodruff 54568, (715) 356-5211. Lake map. Two dams, two lakes, a trout stream, sand beach, prairie remnants and a nature center are featured on 2,891 acres of rolling countryside. Popular campground and excellent cross-country skiing. 1034 Cty. Hwy. A, Hudson 54016. (715) 386-5931).. Park map. For more information on this topic, ask Wisconsin State Parks, (608)266-2181.